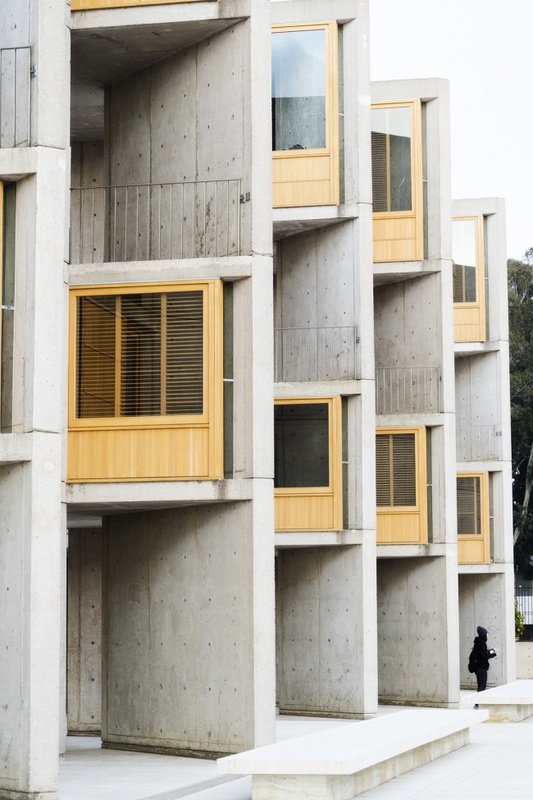 Salk Institute is one of those mind blowing places that you can’t believe is real. The most unbelievable part about it is that it’s a part of the University of California San Diego campus and that scientist can actually get work done in this beautiful place. This was my second time visiting Salk. The first time was last year, but I knew I had to go back for this year’s trip. However, the main goal of this visit was to capture it differently than last year. I started off with my wide angle that provided me with some really cool views but spent most of the time with my 70-200mm. This allowed me to compress much of the building to provide the unique views that I was looking for. Even though it seems like a really quiet place, there are people all around. Maybe because sunset was around 5p when working hours typically ends and people were leaving to go home, but there were people walking around at almost any given moment. It could also have been that I was there at sunset and other people wanted to get that golden hour glow on the buildings but I was definietly not alone. The unfortunate part is that you’re not allowed to walk up the stairs. I totally understand why but I would have loved to capture someone standing at one of these stair landings. The best I could do was capture a fellow photographer at the very bottom of the steps. Either way, I love the way that it turned out. The pattern, the line, the shapes just fascinate me. I could seriously spend a whole week here and not get bored. My camera settings for this image is F4.5 at 1/80th sec at ISO 1250 with my Sony A7II and 70-200mm zoom handheld. If we are going to go in chronological order, this image would be next. The third image in the series this week of keep it movin’. Why photographers should keep walking around to find multiple compositions instead of finding one that works and stay in the same spot. You can see the first image here and the second one here. Now that does not mean that you can’t go back the same spot. I think certain composition work better than others depending on the light. You may be at one place but 20 minutes later see that the sun will hit it in a certain way and you’ll see something totally different. That’s fine. Just don’t get stuck! I originally started off this photo trek at the reflecting pool. I walked from one edge of the pool to the edge but nothing was really inspiring me so that is when I decided to turn around and walk up the Lincoln Memorial steps. Once I was taking a few pictures of the Lincoln while the sun was starting to really come out and change the colors in the sky. I looked down at the reflecting pool and thought that it was the time to go back down. So I made my way back down and was able to capture this one. I love how the US Capitol is the main focus in this image. You don’t really see this point of view a lot since it’s so far away and people mostly want to photograph the Washington Monument from this angle. Funny how if you look real close, you can see other photographers on the other side of the reflecting pooll. My camera settings for this image is F7.1 at 1/800th of a second ISO 500 with my Sony A7II and 70-200mm zoom lens handheld. Thank you all so much for your amazing feedback on Snap DC. I think I check amazon almost everyday just to read the reviews. They make me so happy and I’m so glad everyone is getting so much value out of the book. If you haven’t already, sign up for Snap DC’s newsletter list. 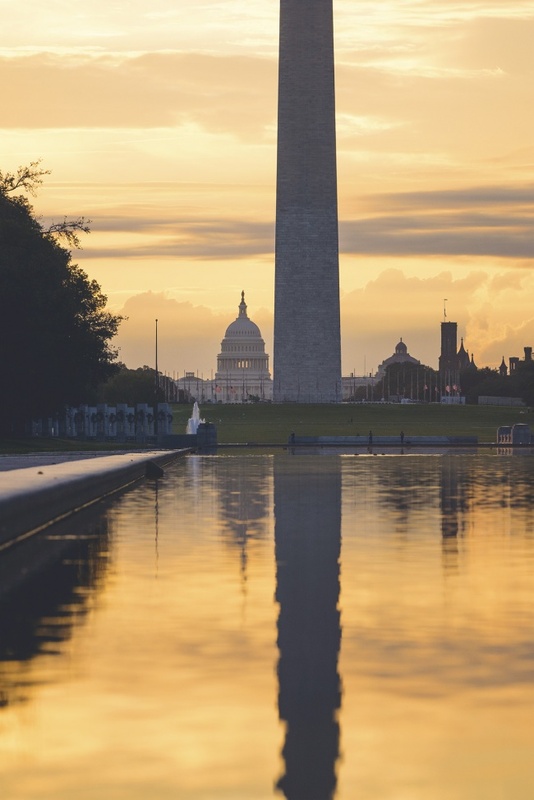 I just updated it so that you’ll receive a free photo itinerary for a 1, 3 or 5 day trip to Washington DC. It really is the perfect supplement to the book and it was so much fun to create. 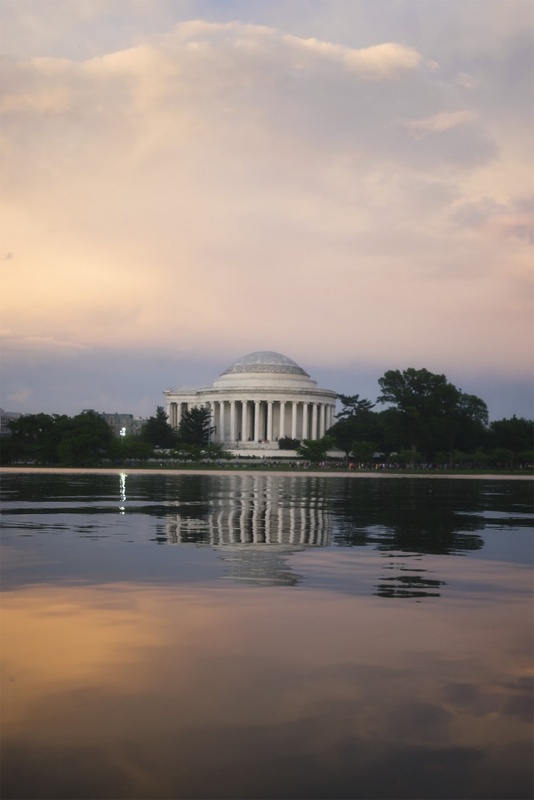 Obviously, the Jefferson memorial and the tidal basin are in the book. Lately, the tidal basin has been my go to place to go shoot. I love the reflections but there’s always something interesting to photograph there. If you look close enough at this image, you can see the bus loads of people visiting the memorial. This was taken around sunset so the memorial is packed with tourists. 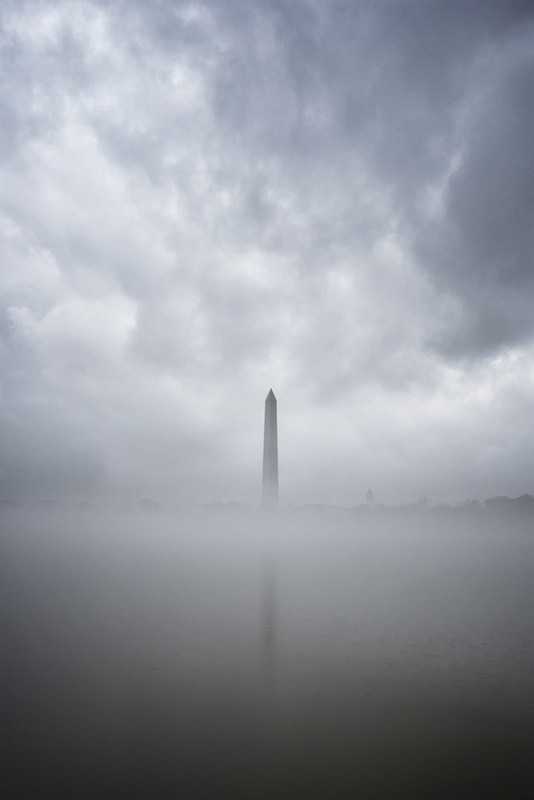 In the book, I discuss my favorite places to photograph at the tidal basin including the spot where I was standing to take this image. Andrew and I were the only ones there and to be honest, I probably got the better image of the memorial than anyone who was that close to it. My camera settings for this image is F7.1 at 1/250th of a second at ISO 400 with my Sony A7II and 16-35mm wide angle lens. Wow! Remember this past winter I kept on saying that this year is the year of the fog. We had so many crazy foggy days and it was so awesome. On this day I was out with my friend, Birch and seriously walked the Mall with what seemed like hundreds of pictures. Every angle was a cool angle because the fog made everything look so different. It was difficult not to take a spooky looking picture. But the weirdest part about this day was we captured this around 11a. So weird! I don’t know about you, but I usually associate fog with early mornings and then it fades away as the sun comes up. But this was pretty much in the middle of the day so I didn’t even need a tripod. It was fantastic! My camera settings for this image is F4.5 at 1/640th of a second at ISO 320 with my Sony A7II and 16-35mm wide angle lens. I went out to take pictures this past weekend on a whim. No real plans, I didn’t even know if the sunrise was going to be good or not. I just missed shooting. I felt like it had been a while since I had been because the week before I didn’t have a chance to go out at all. 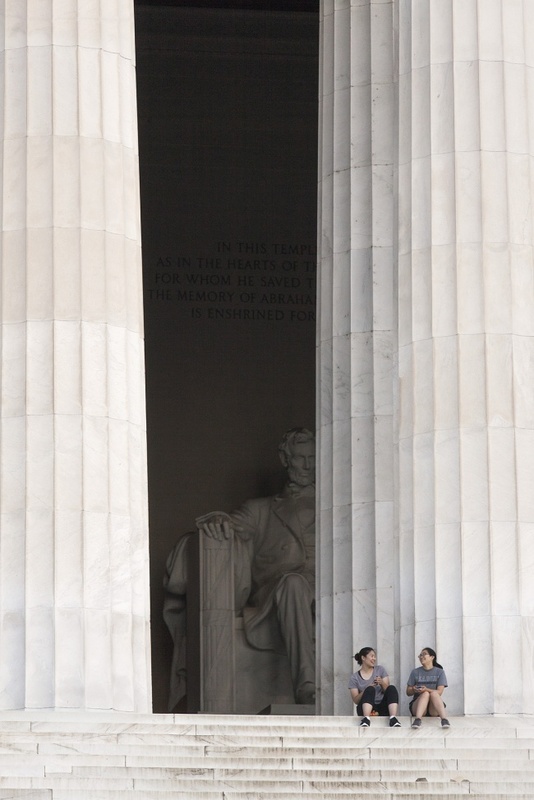 So I went out Saturday morning to one of my favorite places in the world, the Lincoln Memorial. The weekends are so fun at the memorial. This may sound weird but its a totally different vibe. There are so many more people who are out enjoying the sunrise with you and since it’s a weekend, they have the time to just sit and enjoy. Of course there are still runners and bikers, but there are just more people in general sitting on the steps and enjoying life. Looking at this image makes me so happy. Happy because the two girls there are obviously having a great time so early in the morning. At this point I think it was about 6a. But I also like how President Lincoln is behind them sort of watching over them. Usually when I’m out taking pictures I think about photographing in 3’s. 3 points, 3 people, 3 whatevers. So I when I captured this image I liked how that rule of 3’s still applied. The third being President Lincoln. A little different from the other two, but I still think it works! Plus their matching outfits make it even better! My camera settings for this image is F5.0 at 1/640th of a second at ISO 800 with my Canon 5D Mark II and 70-200mm zoom lens. Whenever people ask me about places to photograph in Washington DC, I always have to ask follow up questions because there is just so much to see in our little city. If you wanted sunsets, visit the National Mall. If you want cool interiors, visit the Library of Congress. If you want to know my favorite museum? It’s is hands down the National Gallery of Art. I think it is one of the most beautiful spaces we have in the district. Every time I walk in, I feel so refreshed and so excited about what I’m going to see. The gallery is so large that it is actually divided into two separate buildings and my favorite is definietly the east building. There you’ll see the more modern art, it’s the side of the gallery that changes out more often, but I also love the BEAUTIFUL light you get through the windows while you’re walking around the concourse. And of course, you can’t forget that NGA wall! 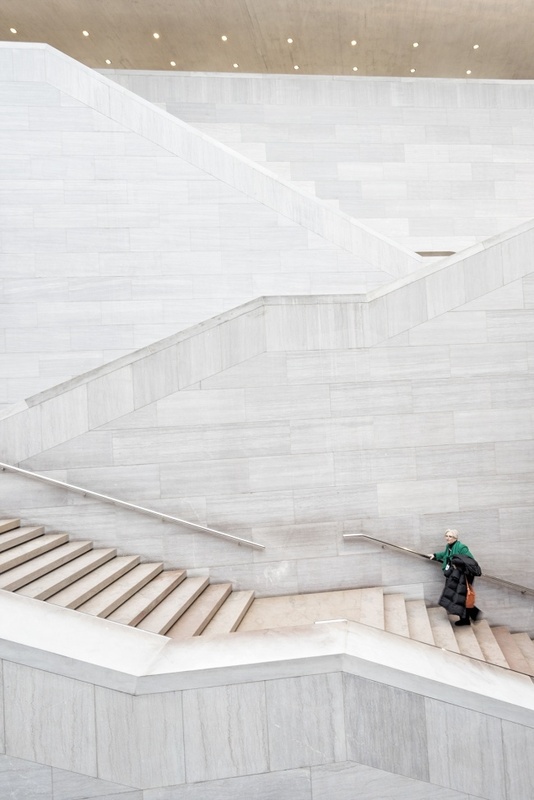 It’s a staircase that is just so beautiful and minimal, it’s been photographed a million times. But each time I see an image from here, it’s like I forgot how beautiful it is and fall back in love. And if you do get a chance to visit the gallery, don’t forget to check out Multiverse by Leo Villareal. It’s a moving walkway that sort of connects the East and the West but it’s will probably be the coolest moving walkway you’ve been on. NOTHING like what you see in airports. HAHA. I really wish I could have included museums in Snap DC. This would have been the very first place I would have mentioned to go visit. I just can’t express how much I love the National Gallery of Art. My settings for this image is F6.3 at 1/8th of a second at ISO 100 with my Sony A7II and 16-35mm wide angle lens.